Cooler than a wool or cotton duty shirt. Our long sleeve Stretch Shirt is cooler than even the short sleeve duty shirt. Weighs less than a wool or cotton duty shirt. Machine washable armor and all. No need to dry clean. Will not fade like wool or cotton shirts. Will last 10 times longer than a wool or cotton duty shirt. The Stretch Motor Shirt is made in the USA, custom for any size rider. 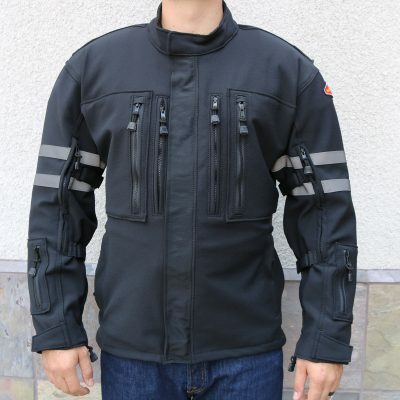 Motorcycle Police all over the country wear Motoport’s Synthetic apparel Made with Dupont™ Kevlar® Fiber. They had a problem even with our Mesh gear when the temperatures were over 95 F. They could not take our jackets off when directing traffic or when going into a restaurant. Some of the officers explained that this would force them into wearing their standard cotton or wool short sleeve shirts that offered no protection in a tumble. The police couldn’t wear both the duty shirt and our jacket together when it was hot. 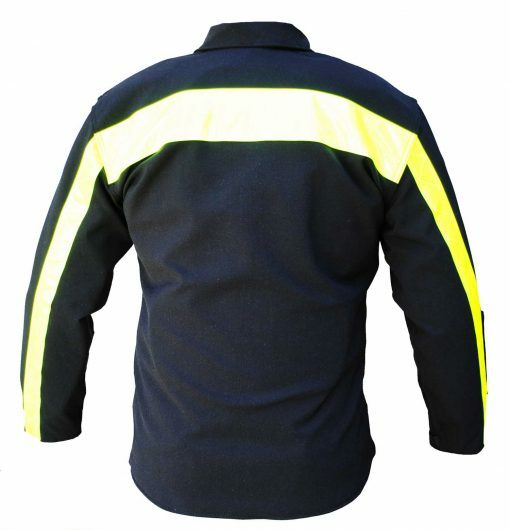 From this demand Motoport started making the Stretch Motor Shirt for the police. The traditional look is important with many police departments. We can match colors and exact style/pockets with your current duty shirt. Entire outer shell is made of 4-way Stretch for comfort. The four way stretch material allows you to layer or wear thermal underwear underneath. Material will not conduct cold or heat like leather or nylon, so even the black color works great for hot weather. See “Save Your Hide” for material tear/abrasions strengths. Stretch collar is sewn down. This was done to match the standard Police shirts. 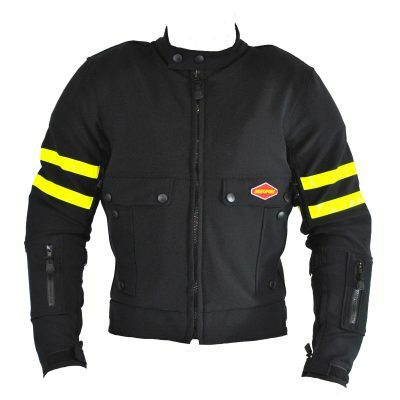 It is often requested to copy the collar on the Air Mesh Jacket. This can be done no charge. Any style custom collar can be made. Heavy Duty YKK Zipper to open/close the front. We can also duplicate the buttons on the duty shirt to match the traditional appearance. The Shirt is made to tuck in, similar to a regular long sleeve dress shirt. It can also be worn without tucking in. Either way because of both the length of the shirt and the Heavy Duty main zipper, the shirt cannot ride us the torso in a tumble. No need to zip our Shirt to any pants. Zippered sleeve cuffs with a Velcro closure that goes over the zipper end. Two front pockets made with Stretch. Any style custom pockets can be made. World’s top rated, lightweight, perforated Tri-Armor that fully covers: back, shoulders, elbows/forearms, and even the chest. All Tri-Armor is in Velcro-secured pockets and can be removed. The majority of police are wearing the Protective Vest and remove the back and chest armor. When riding off duty most riders will put both the chest and back armor back into the jacket. Motoport’s Tri-Armor covers more of the body than any other motorcycle apparel available. This provides the world’s best overall coverage for impact protection. The Tri-Armor is all perforated and does not make the shirt warmer in hot weather. The armor pulls the shirt away from the skin making an air space for the perforated armor to breathe. Hydrophilic Nylon Mesh Lining on the inside. The Hydrophilic Lining wicks away sweat and makes the liner more comfortable, even when worn directly against the skin. Velcro on patches $7.00 each. Strongly recommended, our shirt will last far longer than the patches. When off duty the patches can be removed. Sew on patches $5.00 each. Small Velcro or sewn on patches $3.00 each. Stretch colors: black, LA PD dark blue, green, brown, gray, red and hi-viz. CLICK HERE to view color samples of our material. Motoport can send material swatches to show the strength and different colors available. 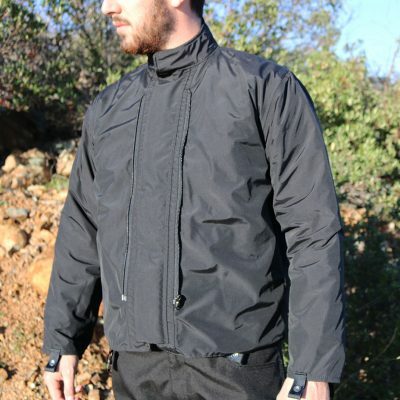 All of the different Stretch colors can be seen on the Ultra II Jacket. 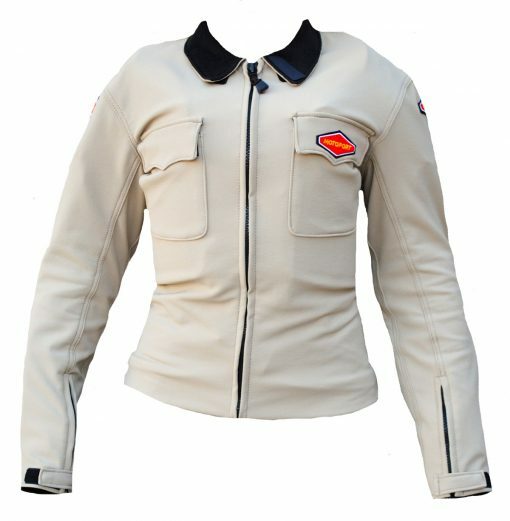 Sizing : For perfect sizing Motoport request that you send us a long sleeve duty shirt that will fit properly when riding. Motoport uses this shirt as a pattern and returns it with the Stretch Motor Shirt when finished. Make sure to put on the shirt that will be sent and sit on the motorcycle, hands on the bars. If you intend to wear a ProtectiveVest please also have the vest on. If the shirt does not fit correctly please let us know. If you want the shirt not to tuck into the pant please let us know and mark on the shirt where you want the length front/back to end. When the order is placed Motoport will provide a Return Authorization #, along with our ship to address to send the shirt. Sit on the bike wearing the shirt that you intend to send. Pull any wrinkles out of the sleeve. If the cuffs extend past the bend in the wrist, let us know how many inches it extends past the wrist. 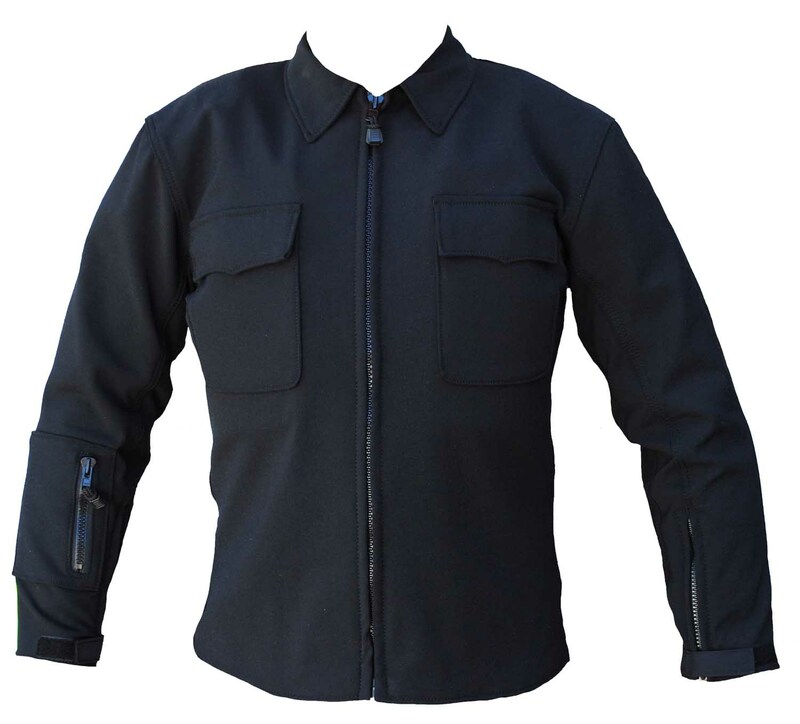 The Stretch Motor Shirt is custom and is non returnable. If there is a sizing problem we can always alter the shirt. To support the claims made by Motoport about materials Made with Dupont™ Kevlar® Fiber, and to confirm the protective/long lasting qualities of this clothing , this garment has a 7-year warranty.